As if the big launch of the Nokia Lumia 900 wasn’t enough on Sunday, April 8th, now AT&T is adding 12 new LTE markets beginning the same day. 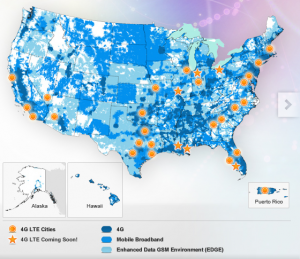 The 12 new markets will bring AT&Ts total LTE availability up to a total of about 43 markets. Although AT&Ts LTE coverage is very small and limited compared to other carriers, AT&T does also have a great lineup of 4G LTE phones to offer. That lineup is much better than what is offered on other LTE carriers at the moment, including the long awaited addition of the Lumia 900 Windows Phone (at a low price of only $99.99 for an LTE device!). Slowly but surely AT&T is getting to the coverage they need, hopefully it picks up real quickly though, if not by year’s end it will be kind of pointless to have an AT&T LTE device.